Are you looking for the best meat grinder for grinding your favorite meat and to avoid impurities? Many people prefer packaging and grinding meat at home for better control on the quality of food. It means you know what ingredients are getting into the mix. For meat lovers, meat grinder is a very important tool to make it safe. With your own domestic grinder, you can eat something delightful and healthy. It provides proper control on the texture and flavor. You may find meat grinders in different sizes, from small to large models which weigh up to 40 pounds. You need to decide according to your needs and type and amount of meat you want to grind. These are simple types of machines with handle crank which pulls the meat with blades. They are easy to carry, use and store due to their small size. As compared to electric models, these types of meat grinders are light. But stainless steel manual grinders can weigh a lot like electric grinders. But you need a lot of strength to use it. Consider the type of meat you will grind, as wild variety is tougher to grind. Manual models don’t cost much. If you grind little bit of meal, it is the best option. These models have a lot of features and options that you cannot find in manual ones. These machines are both efficient and fast. You can ground meat far easily and quickly than manual grounder. Some models can even grind bones and wild meat as well. It takes a bit of effort with electric grinder but sanitation is more convenient. Manual grinders take longer time. There is more room for bacteria buildup when temperature rises. If you need to handle large amount of meat, choose electric models as they can reduce the risk of contamination. But stainless steel models are heavy and more expensive. 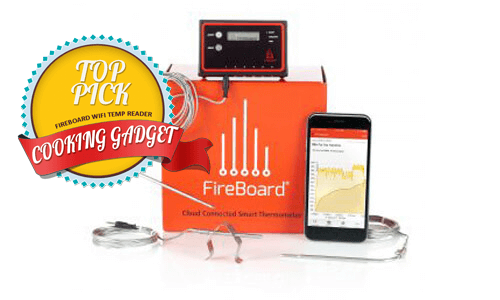 Buyer’s Guide – What to Look for? The durability and price of meat grinder varies according to the material used. Carbon Steel – Carbon steel is known to be the durable, tough and lightweight material as compared to stainless steel. Problem is that they are not that long lasting and are prone to rust if proper care is not provided. Stainless Steel – These plates are long lasting and they don’t rust faster. Stainless steel plate is dishwasher safe but it is not recommended to do so. Stainless steel components also make the machine heavier. Some meat grinders weigh up to 40 pounds as they are completely made of stainless steel. Horsepower – If you don’t grind meat too frequently, consider meat grinder that has only .5 horsepower or less. People who process large amount of meat need to look for grinder with up to .5 horsepower on commercial grade. 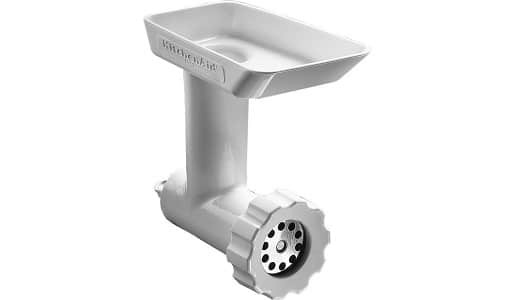 Accessories – Consider what meat grinder includes. Some expensive models have up to 3 grinder plates and sizes of blades for added usage and versatility. You can grind more vegetables with extra attachments. Sausage accessories are also available with these machines. Feed Tube/Tray – Look for bigger feed tube so you won’t need to cut meat into several pieces so to fit it in. It saves a lot of time. Tray holds meat before placing it in feed tube. It is used to feed blades with the meat. If you process wild or large amount of meat, choose grinder with large feed tube and large tray. Be sure to dry out the grinder before storage. Grinder may start to rust in standing water. You will often have to sharpen the blades if they start to dull. If your grinder is used well moderately in a year, it is good. You will want to stop and clean up the fat, skin, and gristle off the grinder. Unplug the grinder first at least once in the process of grinding. If you want to grind the bones, do it only when manual has mentioned that. If you use grinder for purposes other than specified by the manufacturer, it may void the warranty. 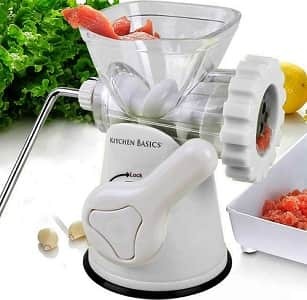 If you want a perfect manual grinder to create the real meat paste, Gideon Hand Crank Manual Meat grinder ensures smooth texture and experience while grinding meatballs, vegetables, and sausages. The hand grinder has great suction base, stainless steel blades and heavy duty materials to easily and smoothly grind vegetables, meat, fruits, and garlic. Many parts are made of high quality plastic and stainless steel to avoid rust. It has interchangeable stainless screens as compared to your needs of grinding sausages or meat. All you need to detach the grinder and throw it in dishwasher. It is both portable and light for added flexibility. There is no risk of injuries as blades are placed well. You can stuff sausages, meatballs, and puree your veggies to make tasty soup. 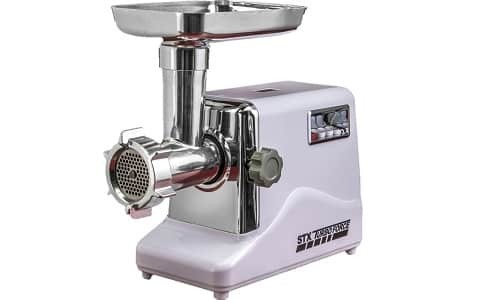 The 3000 series electric meat grinder from STX International outputs the meat grinding power from 800 Watts to 1200 Watts on normal use with its Locked Motor power of 3000 Watts. STX International has been offering top quality meat grinders for more than 9 years. Whether you are a beginner or a seasoned professional, STX Grinder will meet all your needs to get started. It has high quality accessories like 100% food grade cast aluminum grinding head (Size #12), 3 sizes of grinding plates made of hardened/tempered steel, 3 cutting blades made of stainless steel, Kubbe attachment, and a set of Sausage Stuffing Tubes available in three sizes. 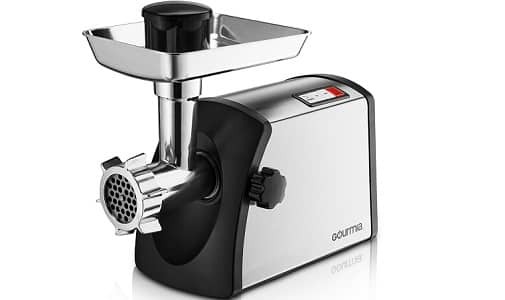 Gourmia is committed to promote more convenient, healthier food habits and it offered Gourmia Prime Plus GMG7500 Ultra-Grind Turbo stainless steel electric meat grinder with that in mind. Gourtmia combines cutting-edge technology with accurate cooking to deliver best-in-class support and customer experience. 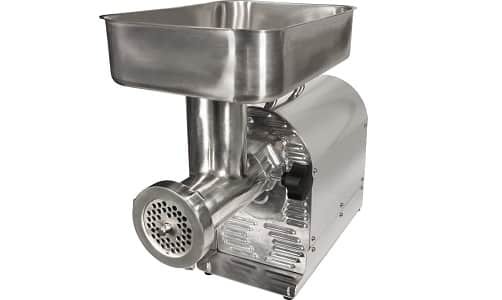 This meat grinder can prepare all types of meat, such as meatloaf, hamburger patties, Kebbe, sauces, or wild game. 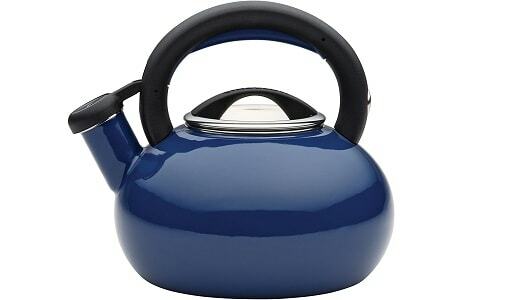 It is made of high quality and durable stainless steel material and 800W motor is ETL approved. It includes three different cutting blades for normal, fine, and coarse grinding needs. You can use it for all types of sausages. The control panel is very simple to use. Add versatility to you KitchenAid Stand Mixer with this tool to deal with different tasks. It has coarse grinding plate which is suitable to grind raw meats for meatloaf or burgers. Make homemade salsa by combining its ingredients and its grinding plate grates hard cheeses instantly and it is helpful to make bread crumbs. You can use this tool to toss meat cubes on the tray, stomp them down, and grind your own chicken or beef for tacos or patties. With added attachments, you can blend your own mixes. It is designed for those who don’t have to grind meat that much. It is the best choice for casual users. It is very easy to clean up and wash. Don’t put other parts in the dishwasher except plates and cutting blades. But you can easily grind up to 150 pounds of meat within just one hour. Kitchen Basics Meat Grinder is also a pasta maker and sausage stuffer. It is very versatile machine for grinding veggies, meat, beans, or garlic. The handle is easy to turn and is ergonomically designed. All you need to insert your veggies and meat and grind it easily and quickly. You can make delicious and amazing homemade sausages and hamburgers with it. You can also use it to crush garlic, nuts and veggies, and also mince or puree veggies for baby food. This grinder gives total control over your ingredients. You can easily control your fat, salt, and other diet intake. 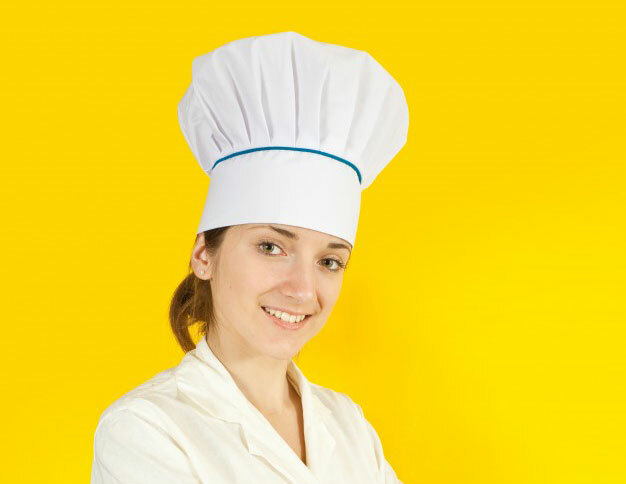 You can easily make meat dishes, sandwich spreads, hearty soups, savory entrees, sausage, and even cakes. 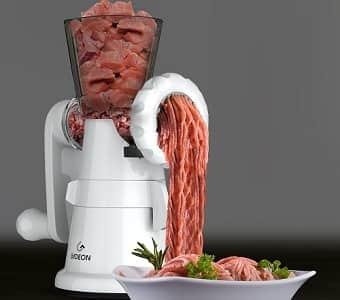 Weston Pro Series electric meat grinder (08-0801-W) is best used to grind field-fresh and farm-raised meats to make your delicious meatloaf, handcrafted burgers, and sausage. You can make delicious range of homemade sausages, such as breakfast links, snack sticks, summer and Italian sausage with 10 to 40mm funnels for making sausage. 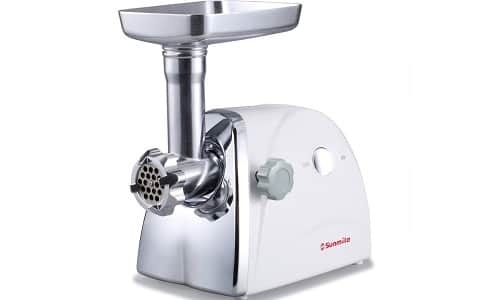 It is another stainless steel meat grinder you shouldn’t miss. 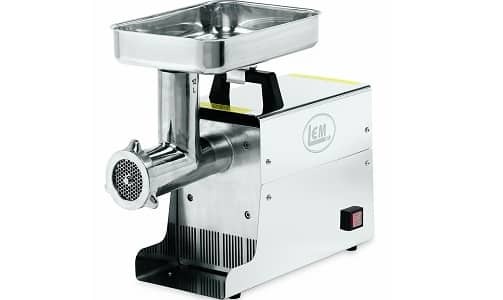 LEM Products is one of the leading brands in offering electric meat grinders. It is very easy to setup and get started. You can operate it with just one push of button and you will get well-mixed meat with it. This meat grinder is supposed to be very heavy and large for stable grinding. It is designed to make your grinding experience a lot easier. Even better, the grinder comes with 5 years of original warranty. How to Clean a Meat Grinder? Meat Grinders are quite popular and they eliminate the need for buying processed meat. They make it easy to grind the meat at home to make delicious dishes. However, it is really important to keep the meat grinder clean because while using a meat grinder, you are dealing with raw meat. If your meat grinder is not clean then your food can be infested by bacteria and other germs. If you are also new to using a meat grinder then you might want to know about cleaning the meat grinder. Here is how to clean the meat grinder properly. Washing the Grinder – Remember to hand wash the meat grinder after every use. Do not leave it for later as the meat and fats can form a crust which can be difficult to remove. Also, do not use a dishwasher to wash meat grinder. It is always preferable to hand wash the meat grinder. Feeding Bread in Meat Grinder – You can run the bread through the meat grinder. 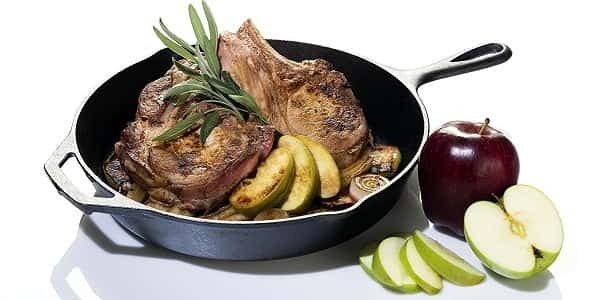 You can do it just like you grind the meat and the advantage of this is that the break will absorb all the oil and the meat particles in the grinder leaving behind a clean chamber and clean blades. Scrub the Parts – Once you have unscrewed the grinder, you can start scrubbing the different parts of a meat Use a scrubbing brush you use to wash your utensils. This is not as difficult as it sounds. Once you are done with scrubbing, you can simply wash the soap water by rinsing the parts. Dry and Lubricate – Now, you need to dry the grinder parts before you assemble the parts. Remember to lubricate the metal parts which are constantly This will prevent any wear and tear on these metal parts and it will extend the life of your meat grinder. This is how you can clean the meat grinder efficiently and remember to clean the meat grinder after every use. No matter what your needs are, mincing, making sausage, or grinding, or even making veg burgers, the meat grinders listed above can do it all. You may even want to make pasta noodles. All the meat grinders listed above have been designed to ensure durability, performance, and great power efficiency. 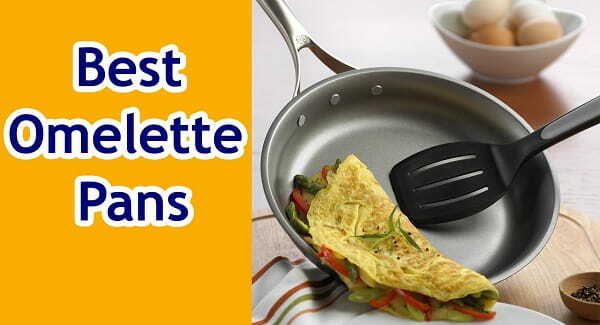 You can easily open up to your cooking skills with one of these products. Consider your budget before buying meat grinder for your needs.